I'm wiring up my motor swap project and it's been years since I figured this all out for the Chevette. I forgot how it was wired up and I'm reaching a dead end in my googling so I'm hoping you guys can help. I'm trying to figure out what pin 110 and 108 are. I'm pretty sure I run 102 to switched 12v and 13 to constant 12v, I completely forget what 108 and 110 got wired to in the Chevette. Edited to add: Discovered Pin 2 on my MPI relay and Pin 10 on the MPI relay were cut and have non-factory wire connectors on them in this harness. Where should these wires go in the factory configuration? The best answer I found is that Pin 10 gets constant 12v power and Pin 2 triggers the fuel pump. I'm not sure if Pin 2 should go to the rewire relay or what though. If you have a factory service manual, it is on page 8-73 of the 90-91 Volume 2 Electrical. I saw that but I don't read schematics very well and all I got out of it is that one wire is involved with the fuel pump and the other is involved with power. I wasn't able to determine where the wires should actually go. Your link is helpful, I'm not just able to utilize it. How about this, click ? Yeah, that was the best post explaining things. I'm starting to remember how I had it wired, I believe one is my fuel pump signal that I ran to there wire relay. The other wire I'm just going to run to constant 12v, pretty sure that'll be correct. Make sure the wire on pin 108 is connected somewhere between the starter relay and the MPI control relay on pin 9. The ECU should see 12v on pin 108 when the key is turned to the start position (when cranking). Pin 110 goes to the ignition switch. 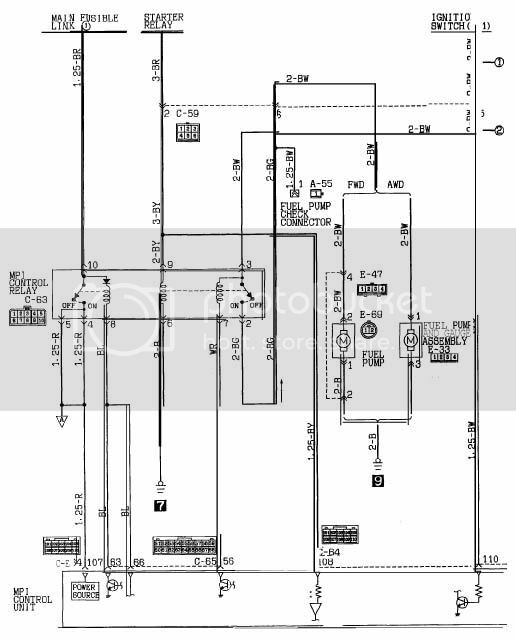 Looking at the diagram, it looks like it connects in at the 6 pin connector (C-59). I believe it would be your 12v constant when the ignition is in the run position. I'd guess that connector would normally be under the dash, but I'm not sure. I can't seem to find a locator anywhere in the manual. Both of these wires should run directly from the ECU to their respective places in the harness, as outlined above. Okay, sweet. The key position/wire power state information was super helpful. The problem is that I won't be connecting the wires to a factory harness, so simply tracing the wires on the diagram didn't get me very far.